cleaner, smelling every atom of whatever happened to be on the ground. And after living with me for about a month, he is hopefully going home to his new family this weekend. Having had Spaniels for over 16+ years they really wanted another Spaniel. I didn't know if he'd show well at the Adoption fair since Journey tends to get really nervous and vocal in crowded places, but he totally connected with the lady's older daughter and even licked her nose. 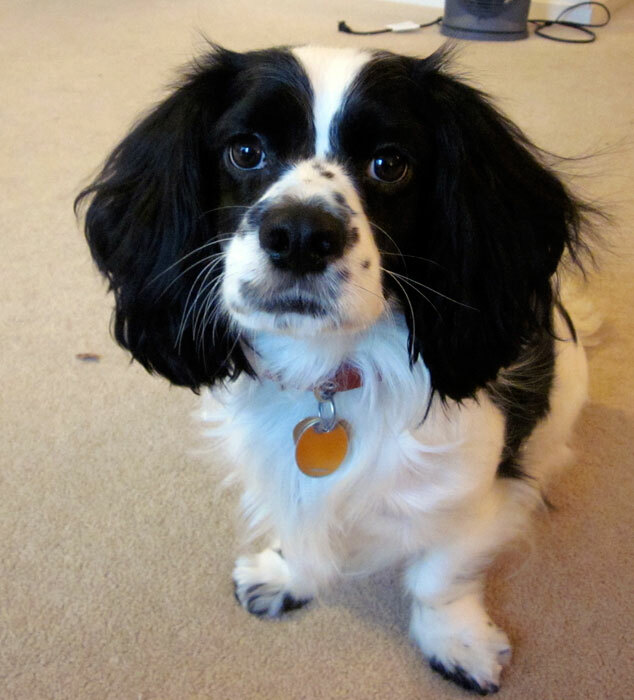 Spaniels hate to be alone, and this family will offer him an almost constant companionship. So after losing his family twice to poor treatment and a misunderstanding, I wish that this third time will indeed be the charm for this little curious Velcro guy. Oh, and the lady said she'll call him Jello, if she gets him, since the names of her previous dogs were Custard and Pudding. There you go Journey, on Saturday you'll become your very own food subgroup!